"I was in a car accident several weeks ago. I broke my wrist and hurt my neck and back. Using his Neurological techniques Dr. Jennings had me pain free in no time. He did his deep tissue work on my back and wrist and improved my wrist flexibility in short time. My medical doctors weresurprised at how fast I healed. He is very thorough in explaining everything." 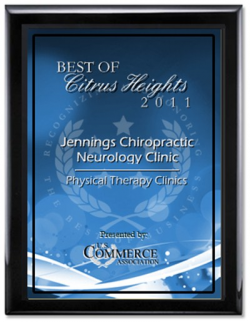 "I sent my husband to see Dr. Jennings for pain in his feet and shoulders. I do not think a "regular" chiropractor would have been able to determine the cause or the best way to teat him. Dr. Jennings understands the connection to pain and the brain...my husband says all construction workers should go see him." "Dr. Jennings is a dedicated wellness professional. He has done deep tissue work massage on several of the local Mountain Lions football players. 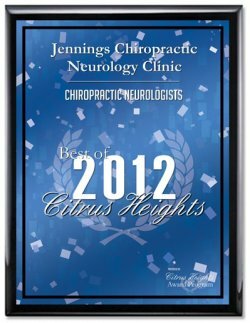 He also has specialized training in neurology, which sets him apart from other chiropractors. He is also well respected in the Sacramento business community." I have been to other chiropractors over the years for various problems. Most have been rough with me. I like the gentle approach of Dr. Jennings plus his nerve approach. I got better faster than I ever did with any other doctor. I highly recommend him."